In late 2012 when Dylan Smith suggested a blog challenge in order to encourage each of us to write more often, I quickly agreed. I don't find it easy to write but I love the thought process that goes into it and I was hopeful that some extrinsic motivation ($ and deadlines) would help me write more often. I'm still in the competition as long as I finish this post by midnight tonight so it looks like extrinsic motivation is "working" in this case. And yet, as a proponent of flow in personal and work habits I find that deadlines sometimes seem to be the wrong focus. If we can prioritize and visualize our work effectively then we should always be working on the most important items - regardless of deadlines. Even if some of our items have legitimate deadlines we should be able to add that to our prioritization criteria. If you have ever played the getKanban game, their inclusion of Fixed Delivery Date cards for auditing deadlines illustrates one way to do this. I met Jabe and some of his co-workers at TLCLabs last year at various conferences. What makes them unique in my mind is that they courageously try out agile and lean ideas within their company. So when Adam Yuret sent along a link to Jabe's presentation "Beyond Deadlines" with the text "TLC spent a year telling employees not to set deadlines. We wanted to know, can you run a business without Deadlines?" - I was eager to watch. Deadlines have their roots in motivating workers who were thought to need extrinsic motivation in order to avoid slacking off. Jabe contrasts this view with Deming's view that extrinsic motivation (deadlines, fear, money, etc) can actually rob us of our intrinsic motivation. I did a quick search on Psychology Today and found agreement on this point - "External motivation, while sometimes helpful, can also undermine intrinsic motivation." Jabe credits Jim Benson for the diagram at the right. Simply put - as your deadline approaches your options are reduced and you choose options to fit the deadline rather than satisfy your customer. As I've been watching March Madness this weekend the 35 second shot clock is a good reminder of this - as the shot clock approaches zero the players end up rushing their shots and miss at a higher frequency. "We are kept from our goal not by obstacles but by a clear path to a lesser goal" - Robert Brault. Deadlines are clear goals - this may nudge you to make choices based on the deadline instead of customer need. Deadlines measure your estimating accuracy, not your project success. As the Buhler study from 1995 demonstrated, even with experience we are still inadequate estimators. If this is true then when we use deadlines we are increasing our rate of failure based on something that is potentially arbitrary. Some deadlines are legitimate and Jabe talks about creating an ad for the Super Bowl game as one example. He recommends doing a 5 Why assessment on your deadlines to find the real reason. If the deadline is only there as a motivational tactic, then perhaps you have other better options. One of the advantages of kanban over iterations is that you don't run out of options for a particular item as it passes through your board. With time boxed iterations, as you approach the end of your iteration and haven't yet met your commitment, you start making choices that cause 'crap'. Flow enables multiple decision points which increases the options available to you and the satisfaction of your customer. Yes, they actively worked towards abolishing deadlines for a full year and made it. The video only goes into part of their story and I wish he had said a little more about this. However, from my conversations with them I understand it was a pretty big hit with both their employees and their customers. One of their employees stated: "For us, switching to kanban was great emotionally, because we don't have to fail every two weeks." From a customer stand point they changed their release cycle from 6 months (with a list of promised features) to 6 weeks (delivering whatever was ready). Their customers appreciated receiving updates more frequently and the opportunity to provide feedback on features more often. As a company, moving towards flow also enabled them to introduce 20% slack time ("do what you think you should do - you are the expert") which they believe increased their overall productivity. 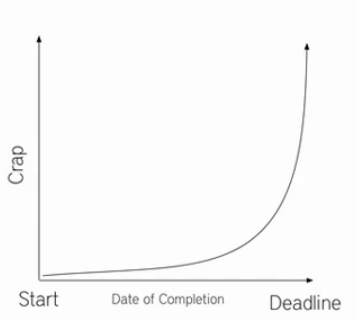 A side effect of abolishing deadlines is that it helped them to find their real (and few) deadlines. Many of us use deadlines to motivate ourselves or our teams - they are easy to use and often seemingly effective. Given both the dangers and the alternatives as described by Jabe, I'm going to try to keep this tool in the bottom of my tool box. Please be patient with me if I give you a funny look when you ask me: "When can you have that done by?" To end this post I'd like to take you back to the blog challenge with our bi-weekly deadlines.One of the members of the challenge dropped out earlier this year. His reason? He felt the bi-weekly deadlines were influencing his content choices and quality. The deadlines were influencing him towards 'crap'.